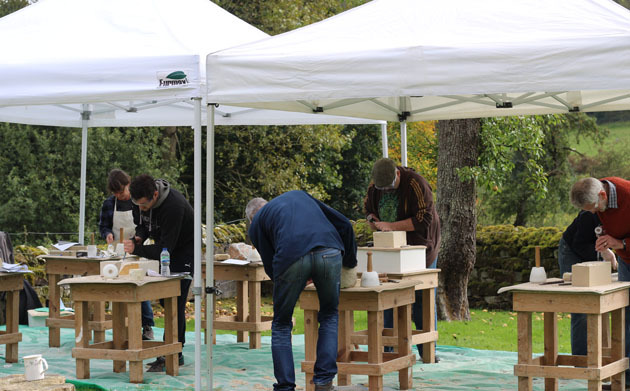 Lastingham was filled with the sound of chiselling over the weekend from carvers on my Autumn Stone Carving Course. 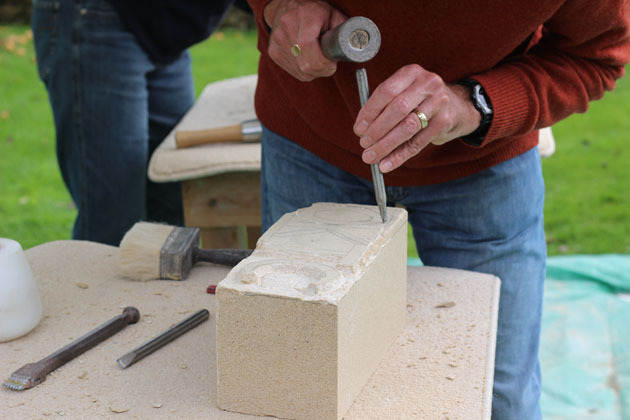 Some of those attending had a little experience of working with tools and had carved before, but for others it was a totally new experience. 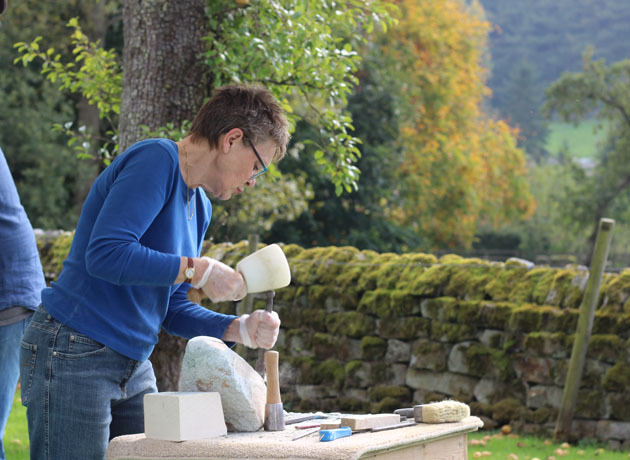 Initially there was a little nervous hesitation, and then great excitement as the sculptures began to emerge, and confidence grew. I loved everyone’s eagerness, endeavour, concentration and creativity – it was two days full of lovely humour, energy and determination – thankyou to you all. A few achy arms, but lots of pride! Here are the finished pieces from the two days and below lots of work in progress. 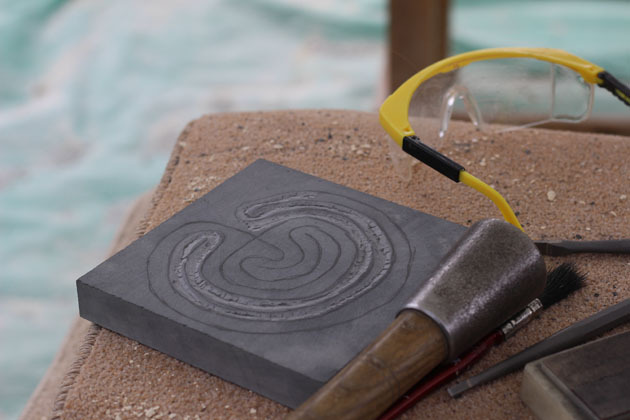 Intricate slate carving and incised lettercutting practice stone, showing the artistry and control required in creating the straights and curves of letter forms. 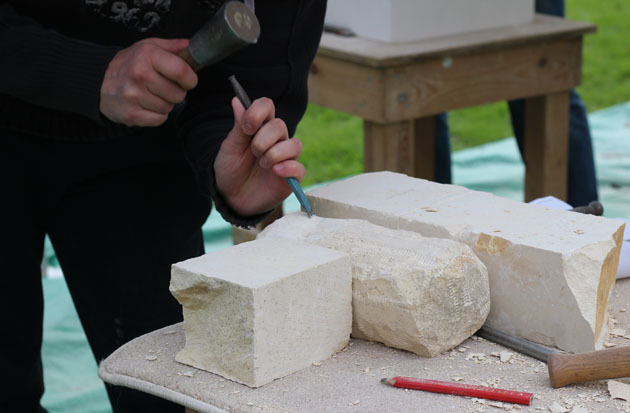 Alabaster carving – this was such a lovely moment when the chisel went into the stone and broke through to the other side to make a hole (intended!). 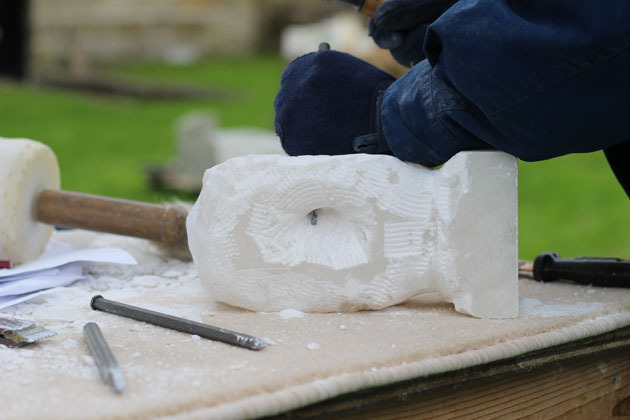 Sanding and polishing the alabaster piece. 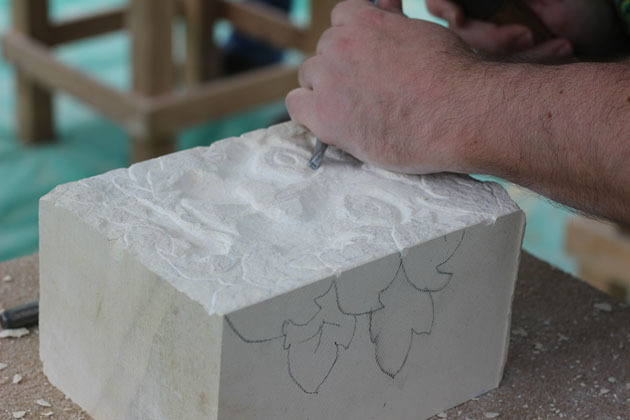 A detailed carving of a green man and his foliage in limestone. 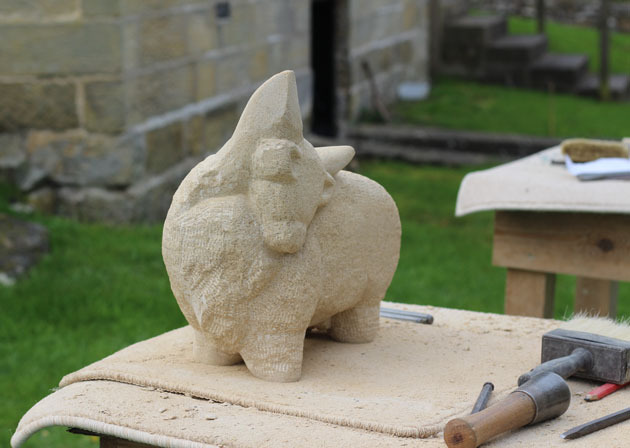 The bird carving was a lovely mixture of areas of stone left natural, and smooth fine carved detail. 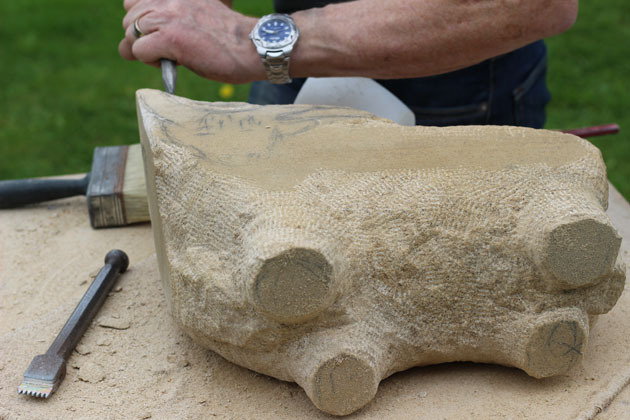 Here some detailing is being carved into the bird’s back. 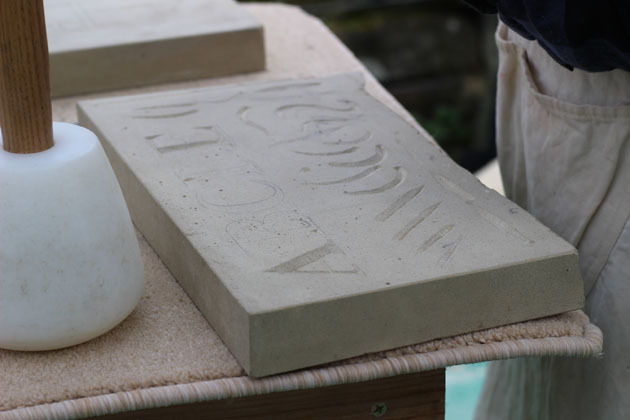 Letter carving in sandstone with the letters cut in relief, so that they stand proud of the background stone. 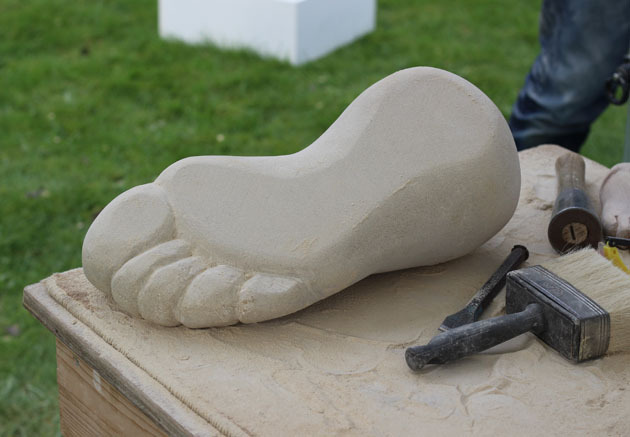 This was an ambitious carving of a foot. 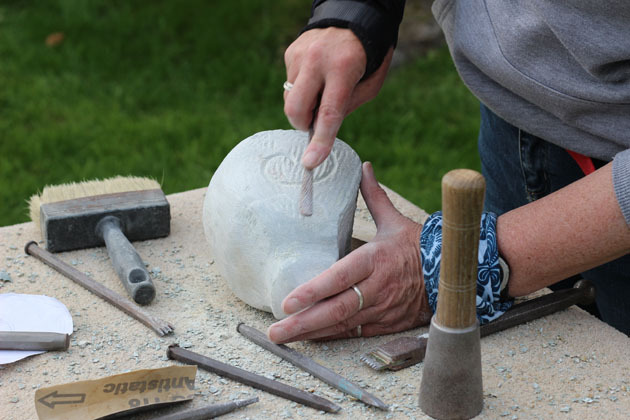 As a guide for his stone carving, John brought with him a small version he had carved in wood. 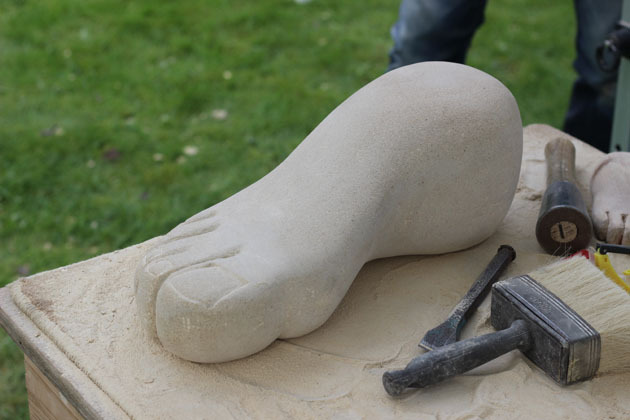 And he carved full detail of the instep and toes on the underside too! A frog carving which had sharp angular detail in the head, leading down to much more personally expressive working for the hind legs – such a clever way to show coiled frog energy! Here it is being filed with a riffler to smooth the head area. 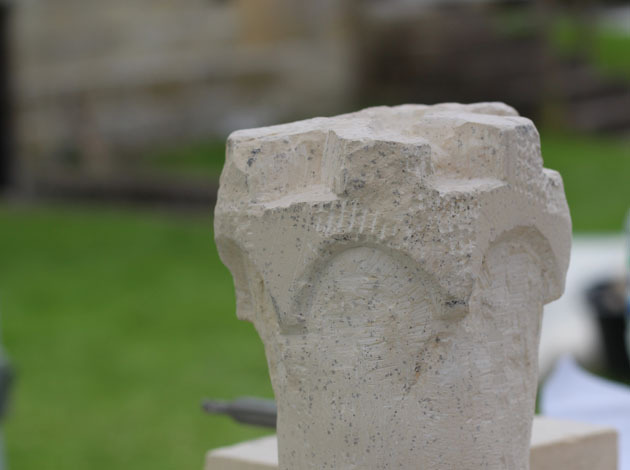 This carving of a tower, with architectural detail was magical, and there was a lot of detail – firstly the stone had to be rounded (made into a cylinder which was wider at the base and top). The more round it gets, the more difficult it is to stop it rolling around on the workbench, so we wedged it with other stones. The top was crenellated, the battlements being part of a turret with detail of the machicolation arches (this is the place from where defenders of the castle dropped things on their attackers – like hot oil, boulders or fire arrows). Wonderful! And a magnificent Highland bull. Some of the tool markings were left to indicate the long coat, in contrast with smoothed nose end, horns and hooves. The carving beautfully conveys a strong, yet gentle character, closely observed and sculpted with feeling – the bull just turning his head as if to look at something on the ground at his side, yet losing none of his stature. 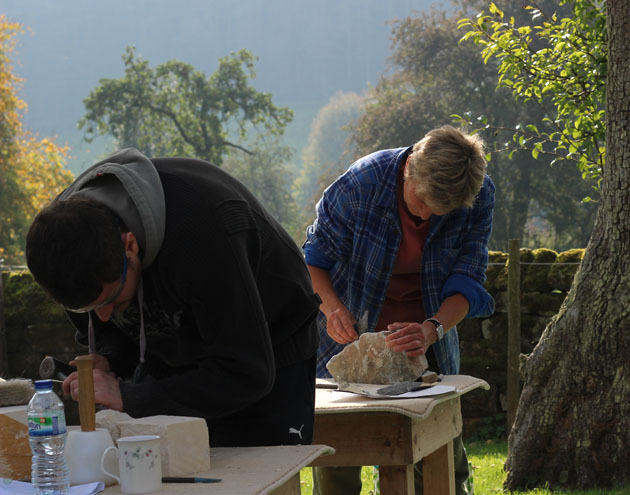 We had a lovely, hard working, creative weekend Ellen, one or two achy arms, but worth it for the beautiful carvings.